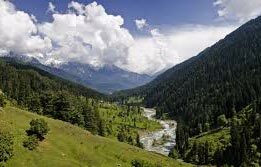 Best of India and Nepal tour is a magical unison of two countries sharing the same cultural roots, but diversified sightseeing experience. 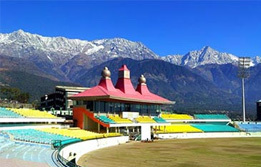 Synthesizing the diverse heritage of India and adventurous terrain of Nepal, this tour package is a great offering from India budget tours if you want to visit these two countries in a single go. The best of hotels and heritage sites are put to display in this itinerary. 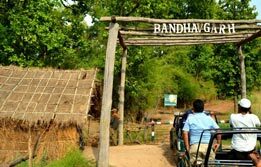 The highlights of this exclusive tour include sunset visit to the Taj Mahal, elephant ride up to Amber fort, boat ride on the Ganges River in Varanasi, Mt. Everest flight seeing tour and Nepalese folk dancing. Upon arrival in Mumbai, meet India budget tour representative for assisted transfers to the hotel for overnight in this cosmopolitan city. After a relaxed morning in the city of dreams, begin the tour of Mumbai. 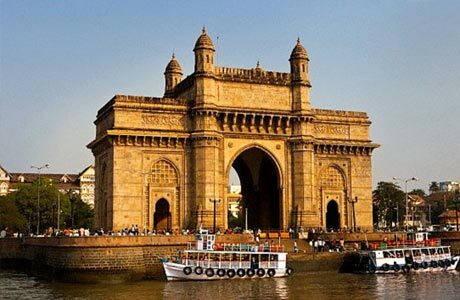 Start it with the visit to the most important landmark of the city, the Gateway of India, which presents the British influence on the city. Continue the tour with a visit to the posh settlement of Mumbai, Malabar Hills and visit the Hanging Gardens here. Later on visit the Prince of Wales Museum, Dhobi Ghat open air laundry, C-link Marine Drive and the Gandhi Memorial Museum. Overnight in Mumbai. The next morning, begin a cruise across the harbor to the Elephanta island famous for a recognized 6th century rock cut cave temples dedicated to Lord Shiva. These sculpted cave temples are also a world heritage site. 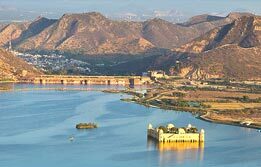 In the evening, take off towards Udaipur from Mumbai airport and check-in at the renowned Lake Palace Hotel, the romantic island retreat meant for the royalty floating upon the waters of Lake Pichola. Overnight in Udaipur. 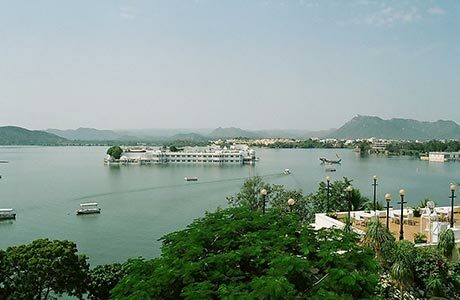 Begin the ultimate tour of Udaipur, the "city of lakes," known for its surreal and picturesque setting. Marvel at the picturesque City Palace, Saheliyon ki Bari or "Garden of Maids" as a part of this ultimate city tour. Later on, move towards the folklore museum, where you can see a presentation of the string puppets typical to this area. Afternoon is at leisure. Overnight in Udaipur. Check out Udaipur for a drive to Jodhpur , “the city draped in blue hues.” En-route visit the beautifully sculpted Jain temples of Ranakpur. This is renowned for marble temples, the largest one is dedicated Adinatha and features over 1444 exquisite marble pillars, each one is differently carved and not even two of them share similar carvings. Upon arrival in Jodhpur, check in the Taj Hari Mahal Hotel for two night stay. 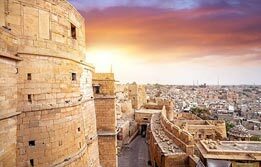 Jodhpur, the second largest city of Rajasthan is bestowed with an invincible past. 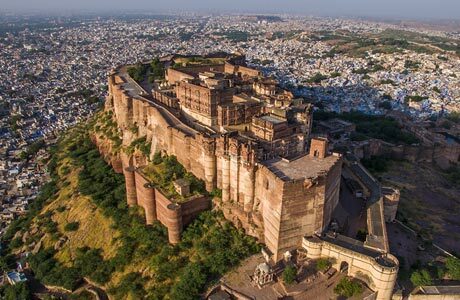 Visit the invincible Mehrangarh Fort from where you can easily see the city’s cool temperament with blue washed walls. Also visit Jaswant Thada, a graceful marble cenotaph built in 1899 for Maharajah Jaswant Singh II, and cenotaphs of other Maharajahs of Jodhpur. Afternoon is at leisure. Overnight in Jodhpur. 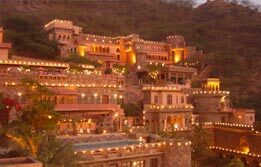 Travel to Jaipur, the capital of Rajasthan and the palatial pink city. Check in at the Maharajah's former residence, the royally affluent Hotel Rambagh Palace for two nights. 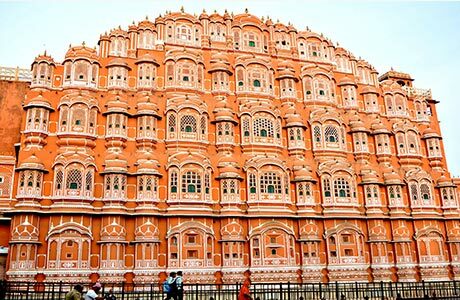 This afternoon visit the Hawa Mahal, City Palace and the ancient observatory. Overnight in Jaipur. 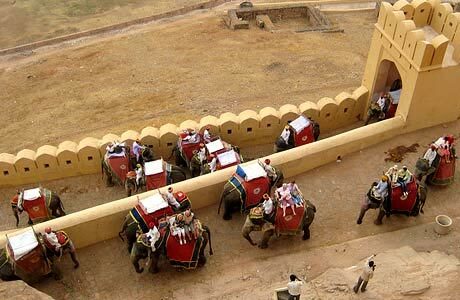 Travel back in time in a royal style of riding elegantly draped elephants to the royal hill fortress of Amber. Afternoon is at leisure. This evening enjoy the cultural side of Rajasthan with a Rajasthani folk dancing performance. Overnight in Jaipur. 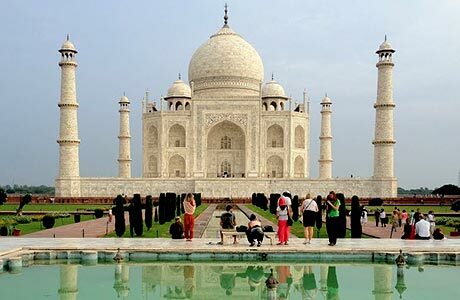 Check out the royal capital for a trip to Agra. Stop en route and visit the abandoned city of Fatehpur Sikri. 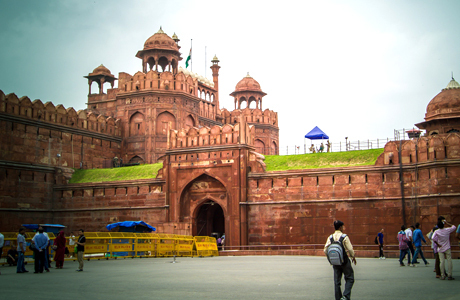 This almost intact Mughal city is a masterpiece of Mughal architecture in India. 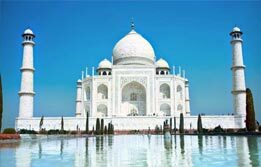 Your afternoon tour includes a discovery of Agra, the former capital of the Mughal Empire in India. 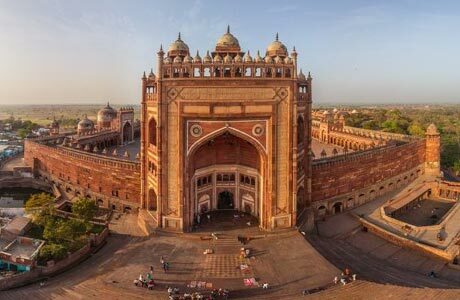 Visit to the 16th-century Agra Fort before visiting the reason of coming to Agra, the splendid Taj Mahal, a monument in testimony of love beyond life and death. Your romantic encounter with the grand Taj will be accompanied with the warm glow of the sunset wrapping this world heritage monument in glory. Overnight in Agra. 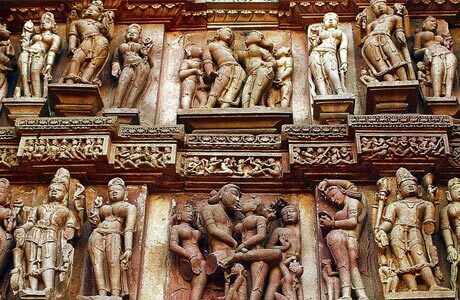 Check out the city of love for another poetic city etched in stone, Khajuraho. Hop in a train towards Jhansi. Continue by road to Khajuraho, en route visiting Orchha, a forgotten medieval city, existing to this day as it must have in the 17th century. Upon arrival, check in the Taj Chandela Hotel. 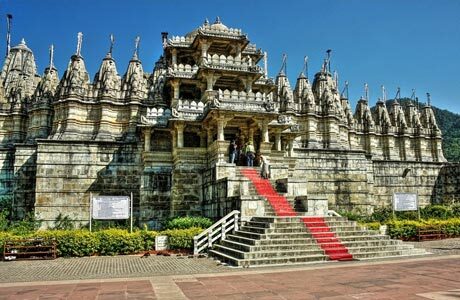 Start this day with an astonishing element here with a visit to the Khajuraho temples. 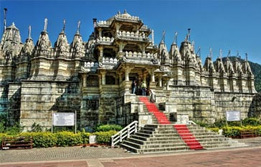 Here, visit the Western & Eastern group of Temples featuring stone etched sculptures and complexes, a world heritage site unique to its existence. Later fly to Varanasi (Benares), India's holiest city. Upon arrival, detour towards Sarnath and visit the stupas, ruins and museum, the site of Buddha's first sermon. 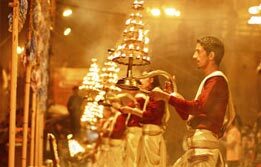 This evening, engage your soul with a hearty sojourn towards the famous riverfront Ghats and see the evening worship ritual alongside the River Ganges. 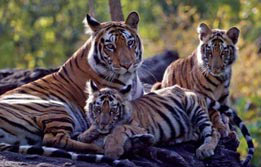 Stay in the Taj Ganges Hotel overnight. Rise up the morning with the early morning boat ride on the Ganges where the holy city will be beginning its course of the day through the rituals in a traditional way. This will be followed by a walking tour of the old city. 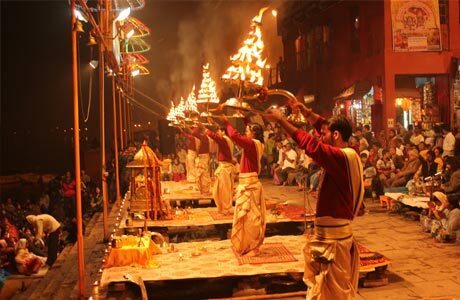 The very same day, you will be transported to the second country as promised in the itinerary, Nepal via a flight from Varanasi to Kathmandu, it’s capital. Upon arrival, visit Durbar Square, Temple of the Living Goddess and Swayambhunath, the firsthand attractions of Kathmandu. Overnight in Kathmandu. 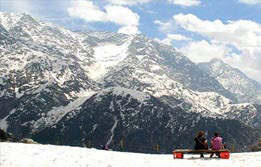 Board in the plane and experience a one-hour mountain flight offering panoramic Himalayan scenery to see the Mt. 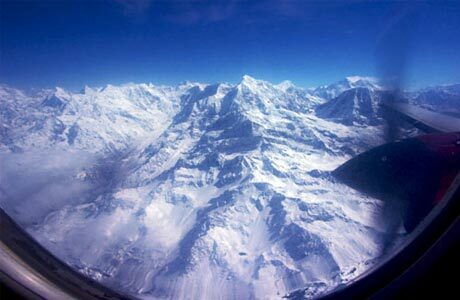 Everest, the highest mountain in the world. (Depends upon weather conditions.) Your morning tour includes discovering the quaint towns of Bhaktapur, Pashupathinath and Bodhnath, followed later in the afternoon by Patan and the Tibetan handicraft center. 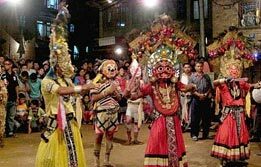 Enjoy a Nepalese folk dance performance in the evening. Overnight in Kathmandu. 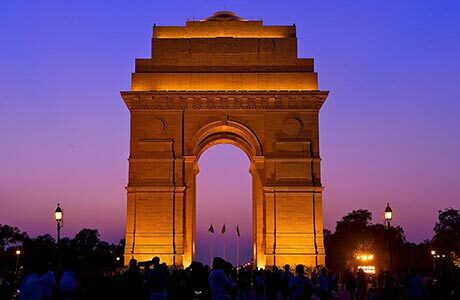 Later morning, fly to India's bustling capital city of Delhi, where you meet our representative for escorted transfer to the hotel. This morning, begin the discovery of New and Old Delhi. Drive along the Rajpath, the capital's broadest avenue, for witnessing the centers of modern Indian democracy, Parliament House, the President's House and India Gate. 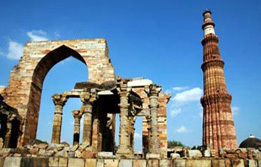 Thereon, visit the Humayun's Tomb, Qutab Minar and Lotus Temple. Afternoon is at leisure. Overnight in Delhi.